“And We place the scales of justice for the Day of Resurrection, so no soul will be treated unjustly at all. And if there is [even] the weight of a mustard seed, We will bring it forth. And sufficient are We as accountant”. And this is the period that this earth is facing the Day of Resurrection, thus God carries out His Court of Justice which is the Most Just that always place the scales of justice, even if the weight of good deed or sin is just equal to the weight of a mustard seed, God certainly will bring forth the compensation. And His Compensation will surely be explained by Him. And no soul will be treated unjustly at all, for truly God is the Most Just and very much calculates everything meticulously. Whoever is firstly adjudicated, they are who have done tyranny upon Eden, His Heaven. Thus, God has made Eden’s problems as the benchmark of His Count, for with whom God should count the benchmark of His Article of Law if there are not Eden’s issues, which could be utilized as the benchmark of His Count. Hereby, we put forward to the public God’s Statement in His Court that within His Vow and our vow, it has included the covenant that God will hold His Court of Justice and His Judgement in this world. As for that covenant, it is already the time for us to state that this is the time to begin God’s Court of Justice. And the first one is the case of Elfa Diasmara’ discharge by XL Axiata Tbk, Pt due to Elfa Diasmara’s belief upon Eden’s teaching, and he has committed to be Eden’s Follower who willed to make a commitment to forever live in holiness. That matter has underlain Elfa’s Discharge which was forced as a resignation. Thus, we bring forth adjudication upon XL Axiata Tbk PT as the first case to be adjudicated by God openly to the public. My Court of Justice upon XL Axiata Tbk PT is presented through KomunitasEden.com Website, the official channel of My Revelation in human’s world, made to disseminate tidings of My Court of Justice and Judgement which I have announced officially today, October 2, 2015. Queen Lia Eden whom I affiliate to be Queen of Justice or Goddess of Justice, and she receives My Mandate to write down the stipulation of My Court of Justice and My Judgement on behalf of Archangel Jibril the Holy Spirit whom I give mandate as My Most Honored Judge, My Messenger. Thus, it is Lia Eden who comes forward physically representing Archangel Jibril the Holy Spirit before human being. However, Archangel Jibril will still appear as human in this world to take care of My Court of Justice and My Judgement and to handle matters which involve the role of world important figures, and heavy world problems which are difficult to be overcome. Align with it, the miracle of Archangel Jibril’s appearance in human world is also divulged. And it indicates that My Court of Justice and My Judgement have been officially held in human’s world. The first we hold is adjudication upon XL Axiata Tbk PT as this company has discharged Elfa Diasmara by forcing him to resign, as if it was his own will. As for Elfa Diasmara, he was discharged due to his decision to choose Eden as his belief, thus We consider it is needed to begin executing My Court of Justice by stating Our Adjudication upon XL Axiata Tbk PT. The forcing to make that statement of resignation can’t be issued by the reason of changing belief. And that is a violation of law to the right of employee and the right of religious freedom for everyone, those two are related to the act and article of the law of human rights. As XL Axiata Tbk PT has fired its employee, Elfa Diasmara, by forcing him to resign without any mistake toward that company. Indeed, he just chooses to believe in Eden which teaches to live holy. Indeed Elfa Diasmara has made commitment be willing to forever live in holiness. And his commitment is based on his vow unto Me. Then, what is Elfa’s mistake, if he chooses to live holy and ensures that he will not commit any sin anymore? Supposedly XL Axiata Tbk PT should respect his commitment and be grateful to have such employee who is certainly honest and responsible. As for, the mistake done by XL Axiata Tbk PT initiated by provocation from the family of Marzani Anwar, who is Elfa Diasmara’s father. His provocation was responded by Fery Firman, Elfa Diasmara’s supervisor, allied with 3 HRD staff, Ronnie, Rinaldi and Nashrudin, who then agreed to force Elfa Diasmara to write his letter of resignation on August 27, 2015, whilst the reasons of it were dictated by force. As Elfa was forced to state that he has come to Eden since May 29, 2015 and henceforth he didn’t provide a living for his wife and his children, for since that time Elfa has been funding Eden. XL Axiata Tbk PT forbade Elfa Diasmara to involve the name of their company in Elfa’s activity in Eden. And Elfa should maintain religious tolerance not to discuss, which is considered as against tribe, religion, race and intergroup. Elfa was obligated to make consultation with Islamic ulema in accordance with the direction from the company, for in XL administration, Elfa was still listed as Islam adherent. As for statement that obligated to be written by Elfa, it is indicated there was no religious freedom applied in the company. Thus, all requirements ought to be written by Elfa Diasmara underlay the reason of his discharged/resignation. Elfa Diasmara impossibly engaged in a discussion against tribe, religion, race and intergroup for Eden teaching is intended for the peace of all religions. Thus, Elfa will certainly not dare to not be responsible for financial support of his wife and children, for that is the concrete teaching of Eden. In fact, Elfa still financially supported his wife and children and kept paying the installment of his wife’s car, until his wife herself who decided to divorce Elfa and refused to be supported by Elfa. Such was the statement of Elfa’s wife, Happy Diaz, as she texted it to Elfa. And those SMS have been recorded in Eden’s documentation. As for Eden’s funders, it is true that one of them was Elfa Diasmara. However, it was his own strong determination and will that he stated when he first came to declare his own interest to joint Eden’s purification totally. There was no prohibition to finance Eden fully with his entire salary, but we suggested him to keep supporting his wife and children. Thus, actually the accusation upon Elfa Diasmara that he has neglected his wife and children is a defamation and a stupid lie. It is too fabricated. Thus, we question that defamation, for that is what underlay Elfa’s discharge, and always stated hyperbolically by Marzani Anwar and his all families. Elfa’s converting belief from Islam to Eden is valid as Elfa’s own choice of conscience. Indeed Elfa Diasmara has believed in Eden since 2004, his own father introduced Eden unto Elfa, but not until May 29, 2015 he had the courage to state his commitment. As for Eden Community, they never asked Elfa to be Eden’s follower. As Eden has never recruited any follower, for the sake of the certainty of the entire Eden Community, whom We have purified since 1997 until 2015, should fulfill the standardized criteria of holiness, which is perfect and equal for each one of them. That standardized criteria was made as a main key to open Eden’s Miracle. Even if We have classified ELfa Diasmara’s holiness will soon be considered as equal with the others, it is because he is the reincarnation of Simon Petrus, who had virtuousness and high quality endeavor during the period of Jesus Apostolate. And also his virtuousness was sufficient enough that soon could be considered as equal with the others, thus Eden Community needs not to be burdened too long by the obstacle of equal holiness’ issue. Thus, we allowed Elfa Diasmara to be Eden follower by classification that it is easy to make his holiness equal with the others who are more senior than him. And he joined Eden precisely at the moment before the phenomenal Eden purification trial occurred at Monas, May 31, 2015. With the presence of Elfa Diasmara in Eden and certainly his loyalty has not been tested and his sins of deception have not been purified, thus it is legal for Us to postpone the elevation of the Messengers of Eden to the main Heaven. 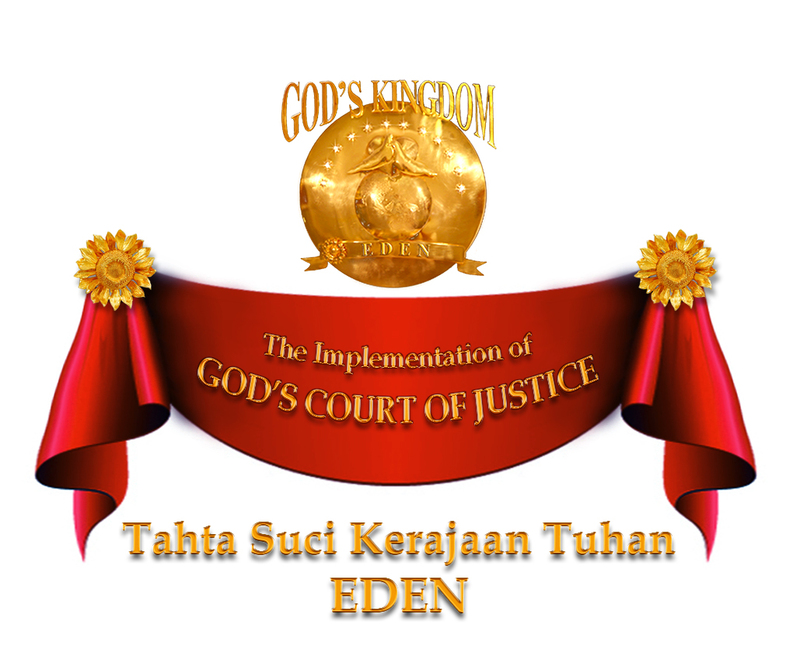 Thus, the joining of Elfa Diasmara We render as a heavy trial for Eden Community, and that is also created to prove faith’s persistence of the entire Eden Community after going through a very humiliating trial for them. Thus, public has also testified the abstruse trials of Eden purification. For after that incident, We would have involved the public in the execution of God’s Court of Justice and Judgement, as now that matter is already in the schedule to be applied. And this is the execution of God’s Court of Justice and Judgement, that XL Axiata Tbk PT has violated human rights related to the right of religious freedom, and has fired its employee who has good character and shown good achievement as well as has made no mistake, except he converts his belief. Elfa’s honesty was not regarded when he admitted that he was Eden’s follower and never tried to spread Eden’s teaching among his colleagues, the employees of XL Axiata Tbk PT, for he knew very well there is no recruitment in Eden, as his experience that was not easy to convince Eden to accept him, except they find that I, myself who allowed Elfa Diasmara to be accepted. From the excerpt of Elfa’s statement forced by HRD staff, Ronnie, Rinaldi and Nashrudin, they dictated the content of Elfa’s resignation letter, and their voices were recorded by Elfa utilizing his mobile phone without the three of them realized of the condition. Thus, it is proved the tyranny upon Elfa Diasmara now we are lifting it up to My Court of Justice. By the evidence of XL Axiata Tbk PT’s mistake, it is proper to submit a private lawsuit by Elfa Diasmara to get compensation upon his discharge. For that purpose, Elfa himself has contacted Jakarta LBH (Legal Aid Foundation). However, now Elfa Diasmara has been forcedly taken away by Marzani Anwar from Eden and next he was detained at Yayasan Hidayah Al-Ikhlas, a rehabilitation center for drug addicts in Sukamantri, Tasikmalaya, whereas Elfa is not a drug addict. Afterwards, Eden together with Jakarta Legal Aid Foundation have found the detained place of Elfa in Tasikmalaya, but Marzani Anwar was more swift and moved Elfa to somewhere else. And Elfa is under close control. As for Elfa Diasmara, he is powerless since when he was taken forcefully from Eden by Marzani Anwar and his family, Elfa never thought that he would be taken away such that, so he didn’t bring anything, except his mobile phone which can’t be reached anymore. Defamation against Eden by XL Axiata Tbk PT is noted because XL Company forbade Elfa Diasmara to appear using the identity as XL’s employee on his appearance in Eden Website. As for previously, there was no word that offended XL in Eden Website, as there is no interest at all for Eden to mention the identity of Elfa Diasmara as XL’s employee. That the one who puts the name of XL on mass media and social media was Marzani Anwar, who wrote about that matter in Kompasiana.com, and it is his family who disputed about it on social media. Whilst, Eden didn’t answer anything upon all calumnies and lies that they put on social media and mass media. However, according to general manager, Ferry Firman, the image of the company has been badly affected due to Elfa’s involvement in Eden. And Elfa’s picture in Eden Website at the moment he was going to the office was being questioned. That picture was not taken intentionally to show Elfa with his name tag. That picture was taken because Eden would like to answer questions from the public regarding who is the funder of Eden. Some people consider Eden is funded by a foreign country, so Eden must state honestly that there are only two Eden’s funders left, namely Arifin Djauhari and Elfa Diasmara. Such that, the picture was taken and uploaded in Eden Website. There is misunderstanding about Elfa’s appearance that used XL name tag. But, could that cause XL Company to lose its good image, so that picture should be put down? It is outrageous! Eden intentionally puts back that picture here, which has been deleted by Elfa Diasmara as instructed by XL Company, so it could be re-examined just to make it clear. Actually, that name tag is not clearly seen as XL’s name tag. In general, no one could recognize it as company’s name tag, except XL’s employees themselves. Thus, actually the order to delete that picture from Eden Website is a form of company’s arrogance and fabrication. When that Elfa’s picture must be deleted from Eden Website, thus it is a defamation upon Eden, and it is exaggerated the image name of XL Company above the Most Glorious and Loftiness of My Heaven. The gap of hierarchical essence is infinite, thus I eliminate the path to Heaven for them who have defamed Eden. You want to see God and be in My Heaven? There is no way for you. Look for your own God in other places. At least their disdain upon Eden as Heaven institution in the world, due to placing the dignity of XL Axiata Tbk PT above the true dignity of My Heaven, so that action upon Eden I regard as proper to be compensated by firm defamation from My Side by revealing the actions of HRD staffs, Ronnie, Rinaldi and Nashrudin and general manager Fery Firman as a conspiracy upon the discharge of Elfa Diasmara that is appropriate to be sued as a law violation. And actually, it is their action that has given a bad image to XL Company. My Statement is far more surpassing your fear of the bad impact upon the image of XL Company because one of its employees is Eden’s follower. As for the defamation upon Eden, it is a defamation upon the Holy Throne of Kingdom of God and God’s Heaven, which is the most sacred and the most sacrosanct, and the most glorious and holy, thus for that defamation it is not only proper to be submitted as criminal violation, injuring of one’s good reputation, but rather should be compensated by a curse of diminishing of blessing. If I am not God, surely I can’t prove the curse of diminishing a blessing. And I forbid not stating the diminishment of a blessing upon XL Axiata, Tbk PT to the public openly. For I will render this as a warning unto whomever tyrannizes upon the minority, marginalized people due to their belief, as the treatment upon the congregation of GKI (Indonesian Christian Church) Yasmin and HKBP Philadelphia, Ahmadiya followers, and Shia in Sampang. For truly they also worship God. And I protect all religions and I am God the One, God of all religious adherents. Such is that My Stipulation of Law upon the parties who marginalized the minority and tyrannize them. My Stipulation to diminish blessing upon them, namely the people who tyrannize people with different faith, whereas they also worship God, then My Stipulation is a diminishment of blessing upon them. Such is My Stipulation I intended unto a person, a company, a mass organization, a nation, and adherents, and whoever tyrannizes people who worship God. My Curse will be openly known by the public as My Court of Justice and My Judgement upon one particular party I ascertain must be proven before the public as a stipulation of judgement from God. Such is My Decision of Retribution Law I will render as the proof of the most sacredness and sacrosanctity of Eden, My Heaven, so it becomes a study and caution of any party who still want to defame Eden before Me. Thus, it is My Law upon the mistake of XL Axiata Tbk PT.